We are spending Canadian Thanksgiving weekend in Tokyo this year. Brad found a seat sale that couldn't keep us away. 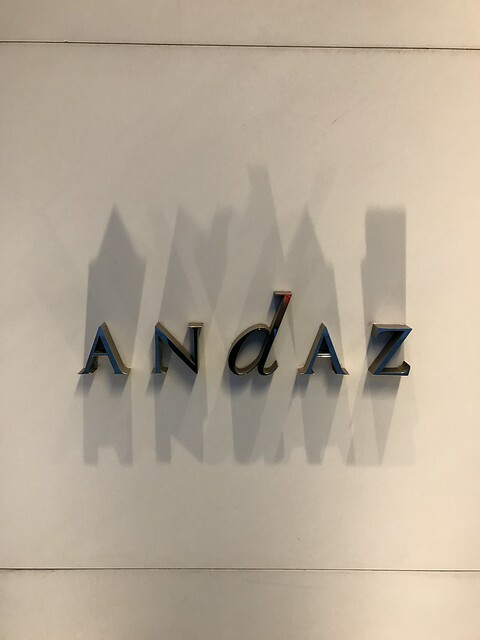 Our hotel this trip is the Andaz, a beautiful, new, modern hotel near the Shinbashi station. Our room is a good size twin room which seems to be quite regular in Japan (the twin beds, not the large size). We are on the 50th floor with a great view of the city, not as great as the other side of the tower which faces the Imperial Palace, but we aren't ones to complain. The elevator up to the sky lobby is the smoothest elevator I have ever been on, it barely felt like it was moving up to the 52st floor. Upon arrival we were asked to sit at a beautiful massive wood table while our reservation was processed. We were offered drinks and explained about all the amenities of the hotel. They have evening sake and wine with various snacks for free. Another perk is that they have free self serve beverages in the lobby... and this extends to your mini bar. Everything that is non alcoholic is free, well included. Our room is a fair size and I love the design. Rich wood and a modern yet traditional feel. The panels on the walls make you feel like you are in a tatami room. The bathroom is beautiful and my favourite part of the room so far. It is night now and we are going to bed. We are going to wake up early and visit the spa... how can I not be excited fora. carbonated pool? This article is in the category: Hotels.